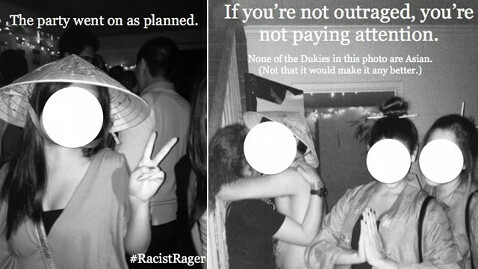 Students at Duke University today protested a fraternity party dubbed the "Racist Rager," at which attendees dressed as Asians, including wearing conical hats, geisha costumes and an inflatable sumo suit. On Tuesday, the school's Asian Student Alliance plastered the campus with fliers that included the fraternity's original email invitation that to a Feb. 1 party called "Kappa Sigma Asia Prime," as well as photographs of frat members and other partygoers dressed in Asian-stereotype costumes. The original invitation, obtained by a student newspaper, the Duke Chronicle, included racist language, including the salutation, "Herro Nice Duke Peopre," and the line, "We look forward to having Mi, Yu, You and Yo Friends … over for some sake." When the email was reported to the Office of Fraternity and Sorority Life, Kappa Sigma sent out a new invitation noting that the party's name had been changed to "International Relations: A Celebration of All Cultures and the Diversity of Duke." Today's protest was attended by around 500 people, the Chronicle reported. "This protest is about the destructive prejudice that must be uprooted from every corner of Duke to make this place an inclusive and safe place for all," Asian Student Alliance President Ting-Ting Zhou said at the protest. Duke members of Kappa Sigma did not immediately return emails seeking comment. The national organization, however, said that the Duke chapter's charter had been suspended. In a similar incident in November, members of Duke's women's lacrosse team threw a Halloween party in which members dressed in blackface.